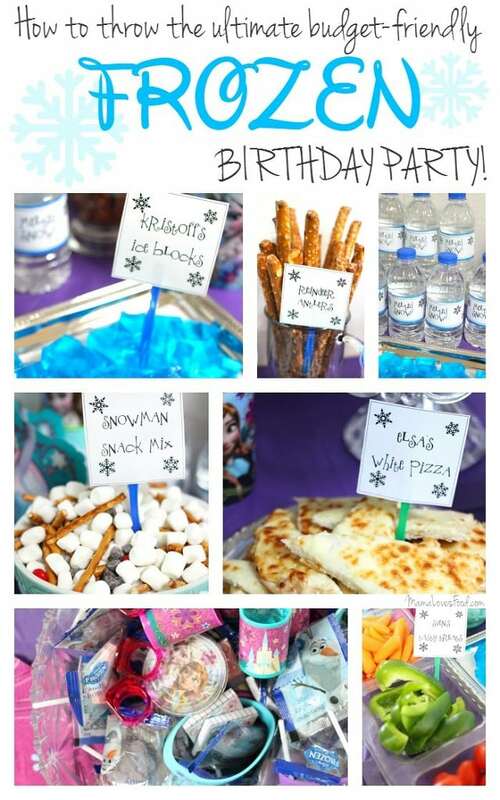 You are here: Home / food / How to Throw the Ultimate Budget Friendly FROZEN Birthday Party! 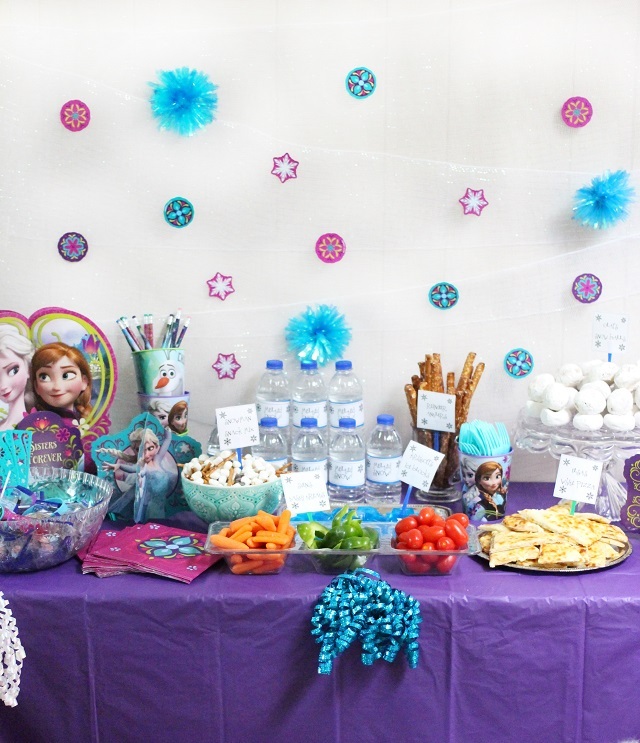 How to Throw the Ultimate Budget Friendly FROZEN Birthday Party! My birthday is next week. Oof. I’ll tell you, they sure do seem to come around more frequently these days. 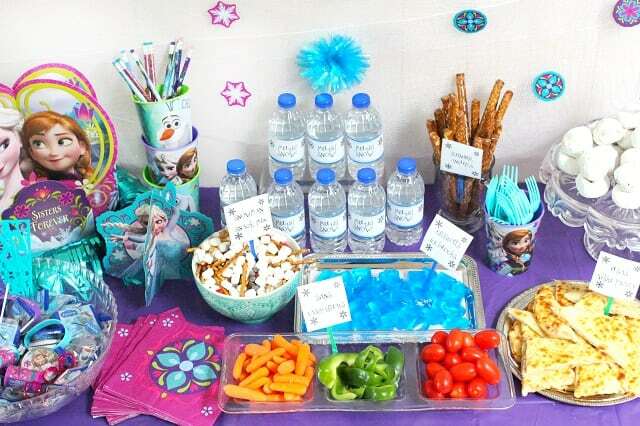 I’m turning 36, but judging by my FROZEN themed birthday party, you’d think it was more like 6! This is what happens when you have five young children voting on what type of party we should put on. And I’ll be honest, we had a whole lot of fun! It was a tight race between Star Wars and FROZEN, but with a little bit of eyelash batting on my daughter’s part, Elsa & Anna won the day. 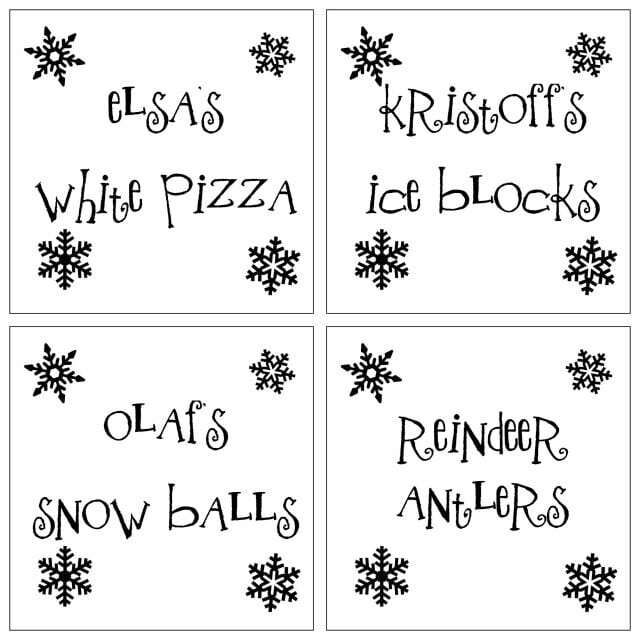 We spent all morning preparing FROZEN inspired goodies and setting up a winter wonderland tablescape, then in the afternoon friends came over and we ate ourselves silly while playing freeze dance, freeze tag, and swimming in melted snow! 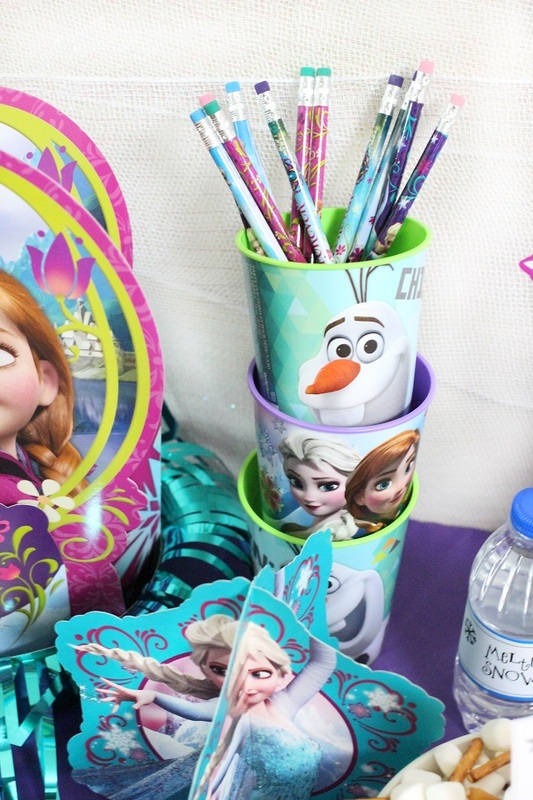 Scroll down to see everything we did, and make sure to save the free printables so you can throw your own FROZEN birthday party! 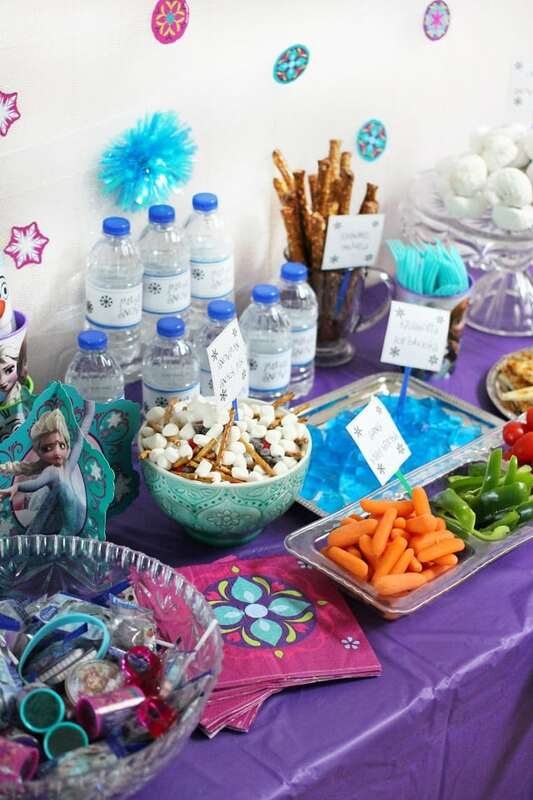 We try not to break the bank on our parties, so I hit our local Walmart for all the food and decorations. 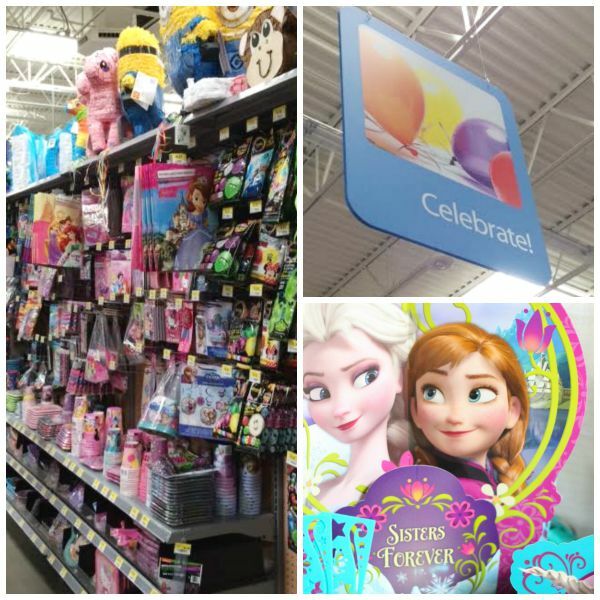 American Greetings has a huge line of FROZEN party items, it was hard to choose! 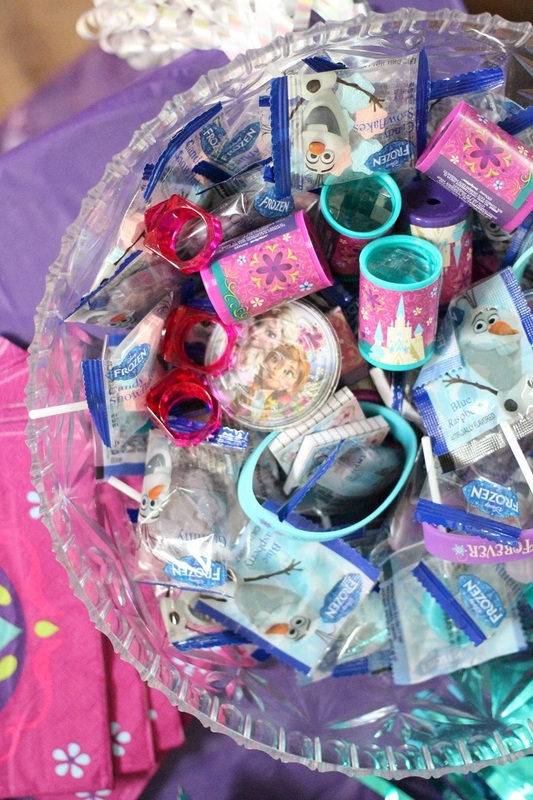 We ended up with napkins, party favor packs, table decor, character cups, pencils, wristbands, and a treat sack. It was the perfect amount of decorations and rather than making up treat bags, I put all the favors in a punch bowl and let the children choose what they liked. 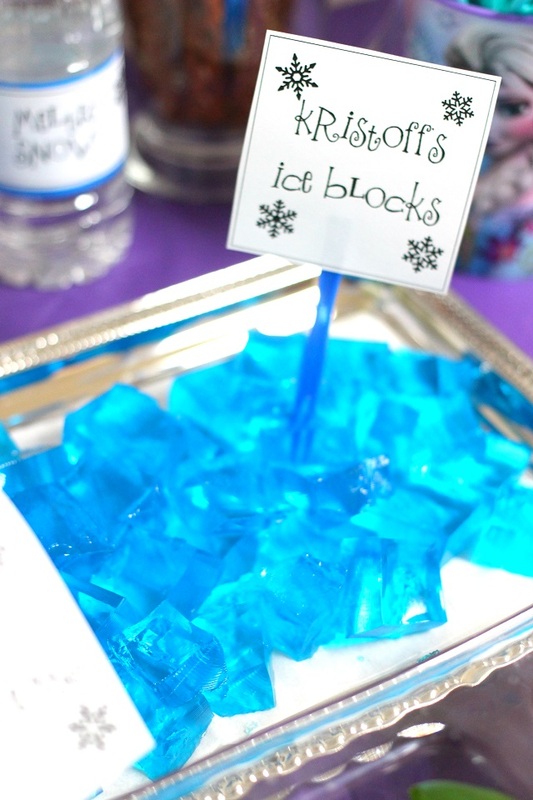 Made from blue gelatin. I added an extra pack of plain gelatin to make them more sturdy and blockish. Everyone loved these! Uh oh! Olaf took a tumble and all his bits and pieces are jumbled. The children thought this was hilarious. 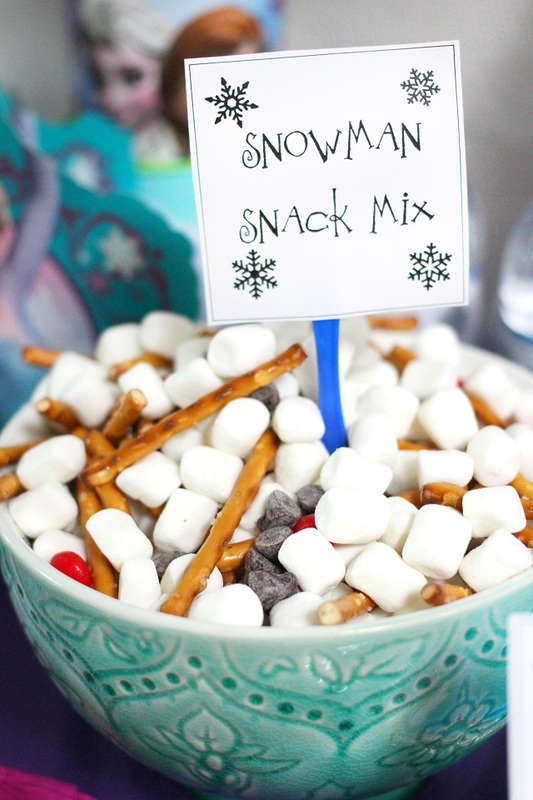 I used mini marshmallows, pretzel sticks, chocolate chips, and cinnamon candies! Nothing fancy here, just pretzel rods, but it was still a popular one. And of course, everyone had to try their “antlers” on before eating! 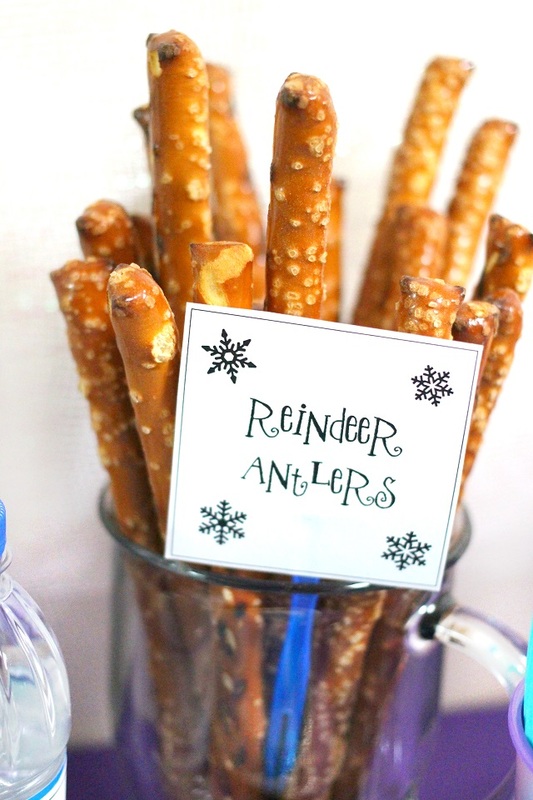 We can’t forget to feed our favorite reindeer! 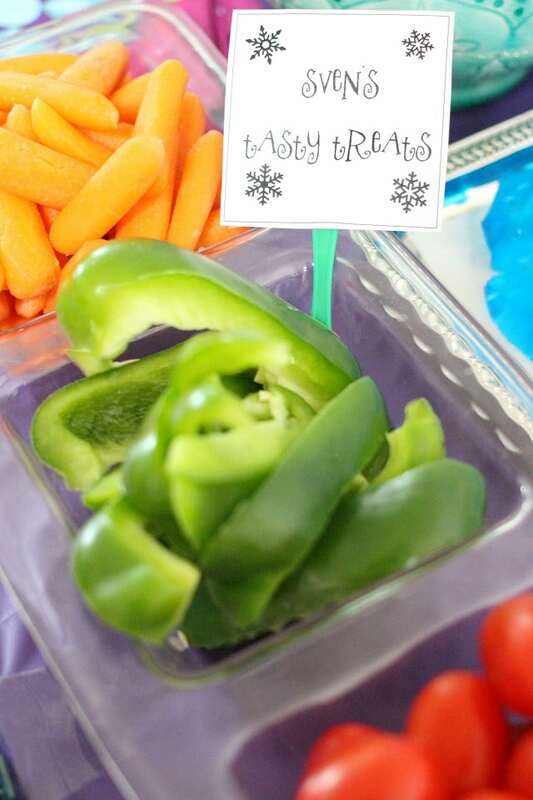 This was the healthy snack stop with carrots, sliced green peppers, and fresh tomatoes. A hit with the moms! 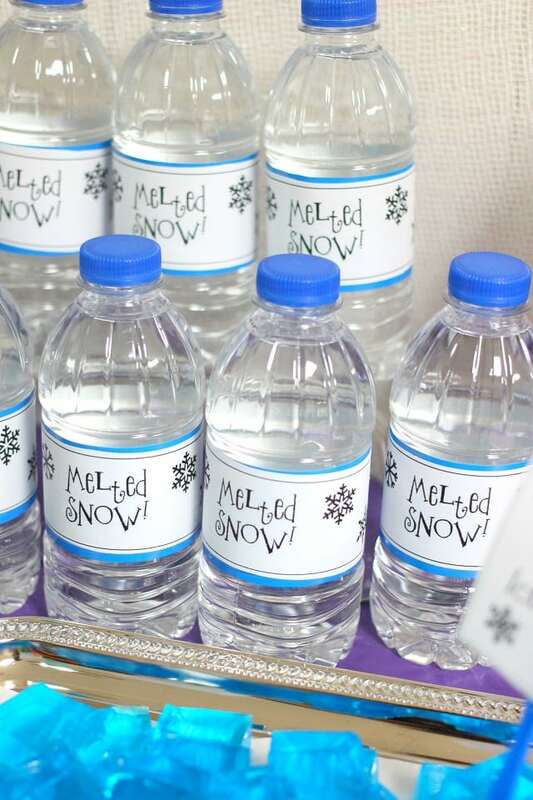 My five year old was most excited for the melted snow, even though he watched me put the pretend labels on the bottles. It’s a simple thing, but this one went over big! Rather than a cake, I opted for a tower of powdered donuts. 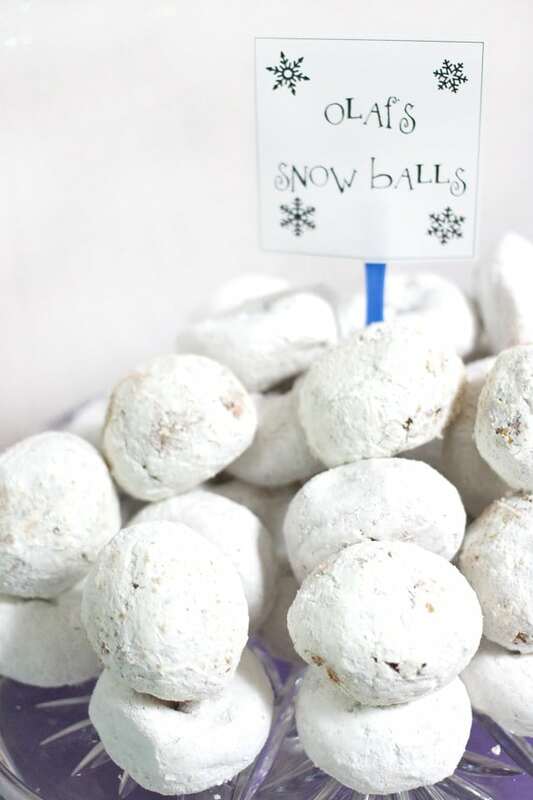 I mean, snowballs. About a billion times easier, definitely less expensive, and still super tasty. There were no complaints about this choice! 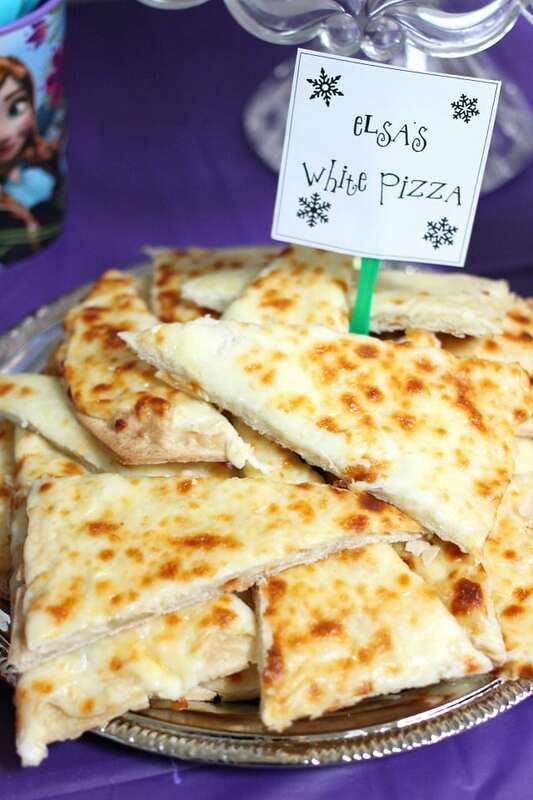 This is my super simple Three Ingredient White Pizza made with store bought flat bread, alfredo sauce, and mozzarella cheese. Deeeelicious! 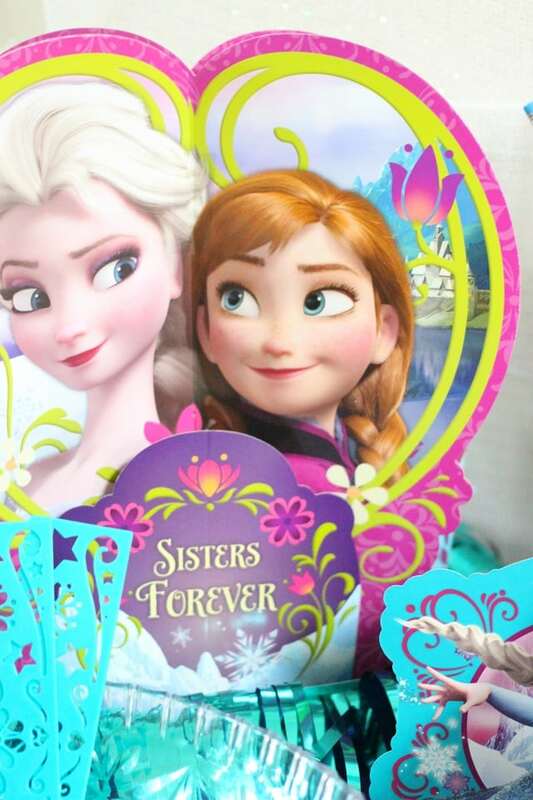 Do you have boys who just aren’t into FROZEN? 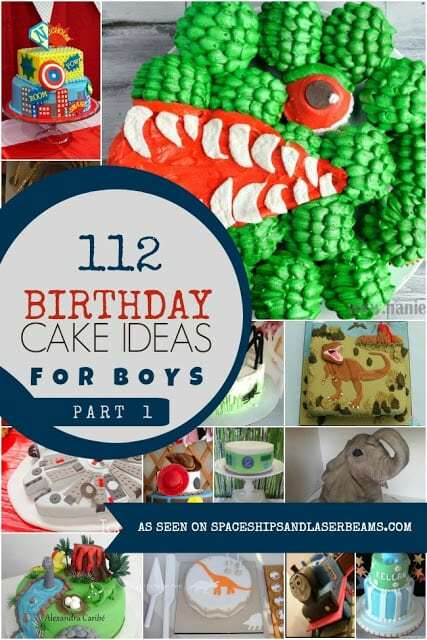 Check out these great boy party ideas from Spaceships and Laserbeams! 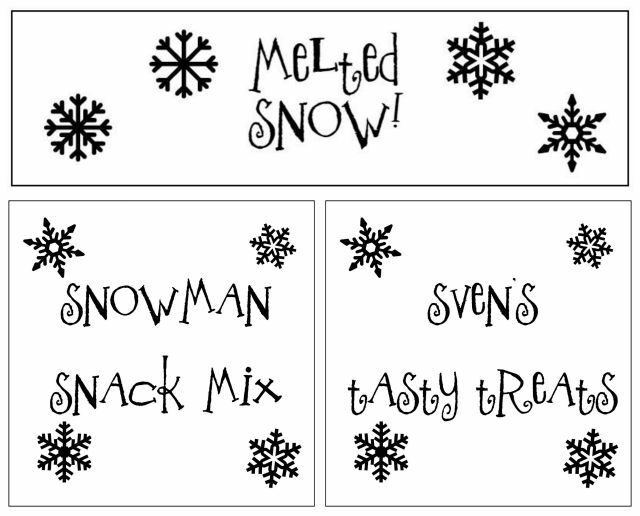 What font did you use for your labels? Wow, incredible layout! How long have you been blogging for? 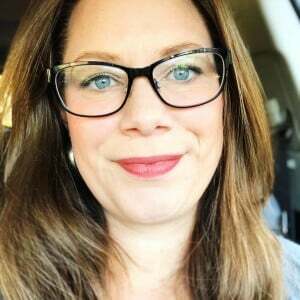 you made blogging look easy. The overall look is fantastic! I tried everything you posted and it was a super party! Thank you for the wonderful ideas! I got lots of smiles about the melted snow in particular-go figure! Thank you!